In 1962 we placed a volunteer in Glasgow, supporting young people in need. He became our first Full-Time Volunteer and so Scotland became the birthplace of one of our flagship programmes. Since then, Volunteering Matters have established a number of high impact volunteering programmes across Scotland: from befriending isolated and vulnerable young people, to keeping older and retired people engaged in their communities through volunteering. 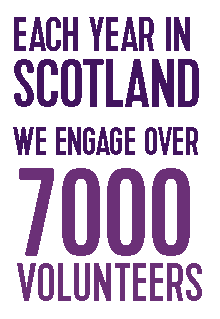 Every year around 7,000 people volunteer with us in Scotland – reaching around 6,000 beneficiaries. Through volunteering, we have helped to reduce inequalities and social isolation to build a stronger, more inclusive Scotland. Take a look below to see what we’re doing across the country: find out more about our programmes and projects, hear the voices of our volunteers themselves, and see how you too can get involved. Run alongside Scottish Natural Heritage, our Action Earth programme empowers people to take action to improve their local environment through volunteering. A partnership project focussed on tackling rural isolation among older people, developed by Outside the Box, Volunteering Matters Cymru and the National Development Team for Inclusion. "I have never felt more commended for being the person that I am." "Knowing that I have made an impact, and watching Sammy blossom into a confident, young woman has made me the happiest and proudest person on the planet." "I feel that we all have a social responsibility to help others in our communities, and befriending is just one way in which I can manifest this duty – whilst having fun at the same time!" "There is so much more to someone than their disability." CSV’s Action Earth campaign enables people to become engaged in practical activities that improve and protect Scotland’s outdoor spaces. Our North Lanarkshire Befriending project has been shortlisted for the Voluntary Action North Lanarkshire VOSCAR awards - the voluntary sector Oscars! Our Communications Manager Haylie Read looks at what we’ve got planned for Volunteers' Week 2017! Young people often benefit from having an adult role model they can talk to and trust. Understanding the benefits of a male role model to these young people and, in a bid to ensure their young users can find a positive role model that suits them, the North Lanarkshire Befriending Project is calling out for more male volunteers.